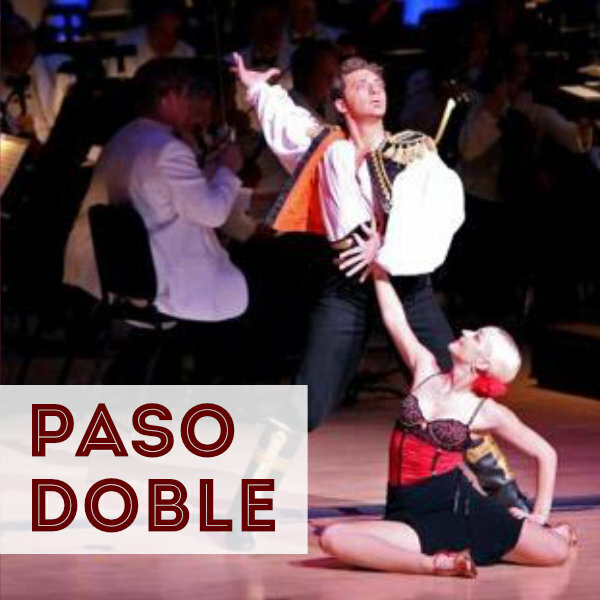 Ballroom Dance A New Year & Enjoy A New You! Feel like trying something new? Looking to romance your significant other? Want unforgettable dance moves before that big occasion? Interested in ideas for Date Night? 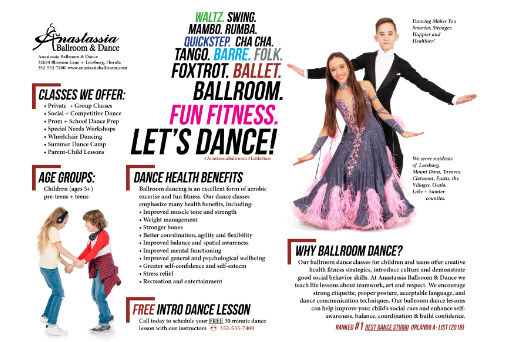 Try Ballroom Dancing, Leesburg! Dancing is one of mankind's most natural expressions of social joy and celebration. Nearly every culture in the world celebrates with some form of dancing. Despite this fact, most of our students think about booking dance lessons for some time before they summon the courage to make their first visit to our studio. 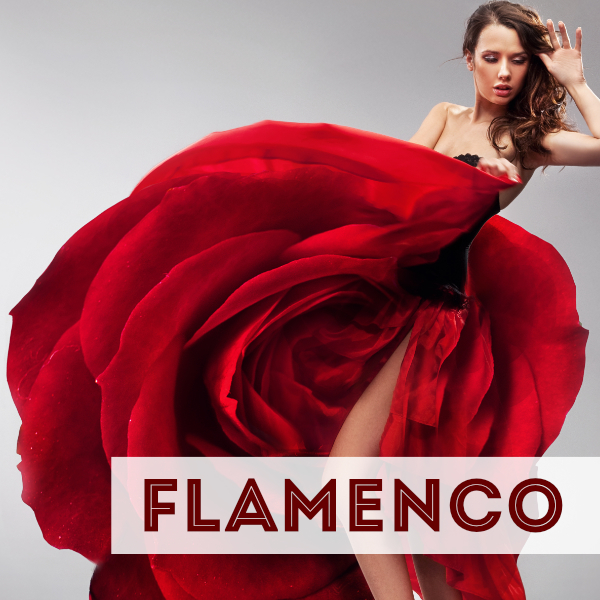 Whether you are looking for ways to get back in shape this New Year, spice up the romance or just want to meet new people social dancing, we guarantee that ballroom dancing is an experience worth trying! 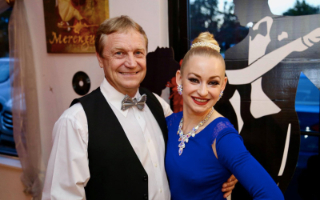 At Anastassia Ballroom, we bring BROADWAY to the ballroom dance floor. You'll have fun, lose weight, and meet new people! The only way to truly understand the ballroom dance experience is to schedule your FREE Intro Lesson and start learning how to ballroom dance Leesburg style. We offer lessons to children, teens and adults. Our website provides resources that will help answer some of your questions and ease your introduction into the world of ballroom dancing. 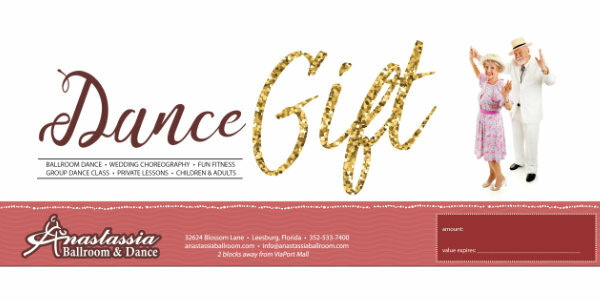 Come experience the fun and welcoming dance environment at our Leesburg ballroom dance studio. You will learn to dance quickly, easily and you don't need a partner to do so! 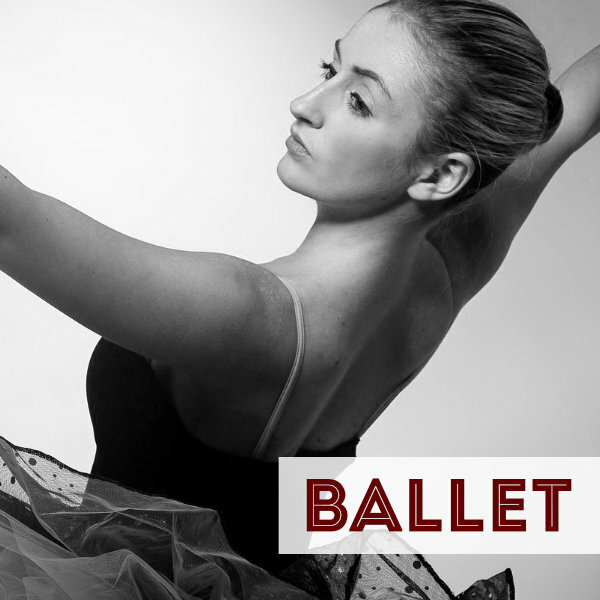 Our experienced dance instructors are highly trained, so you'll have a trusted partner to help you become a comfortable social dancer or a competitive dancer, whatever your goals may be! Visit the best ballroom Leesburg, Florida has to offer! Enjoy our ballroom wedding dance lesson specials and join our monthly Leesburg ballroom dance party social events. Rated Best New Ballroom Leesburg, Florida. 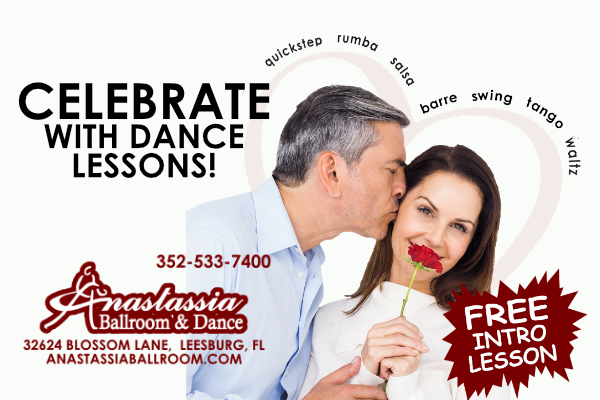 Start Ballroom Dancing Leesburg, Florida with Anastassia Ballroom & Dance. Watch our dancing skills in action! 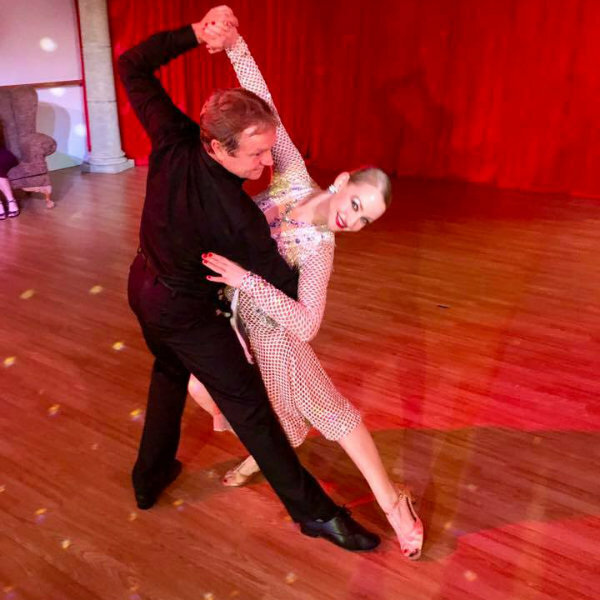 Read some of our ballroom dance reviews on Facebook for more information about our highly rated ballroom dance lessons. Our dances are one of the top things to do in Leesburg Florida as voted on TripAdvisor. 5 out of 5 stars based on 25 ratings. 25 user reviews. Now serving Lake County, Sumter County, Mount Dora, Clermont, Villages, Lady Lake, Tavares, Howey in the Hills, Eustis, and Orlando! BALLROOM SPECIALS: We offer one introductory dance lesson for FREE. Read more about this complimentary deal. We provide a variety of dance bundles and packages. 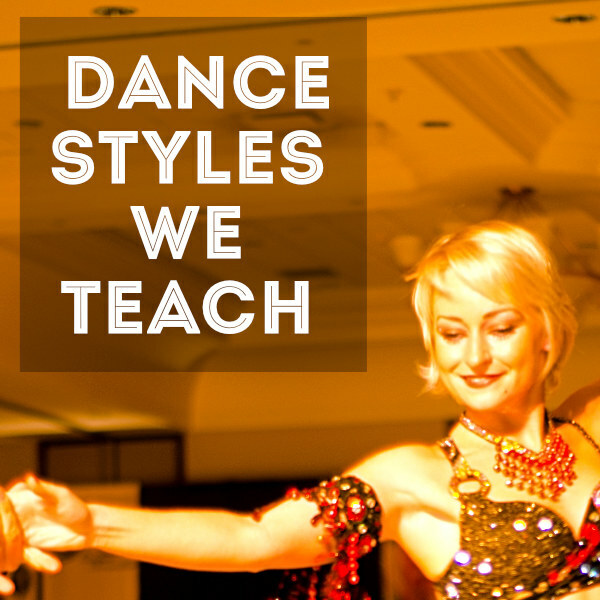 Learn how to dance from the best Leesburg, Florida Dance Studio and master the art of dance with guided lessons from our top ranked dancesport ballroom dance instructors. We offer great wedding dance choreography for you and your bridal party. 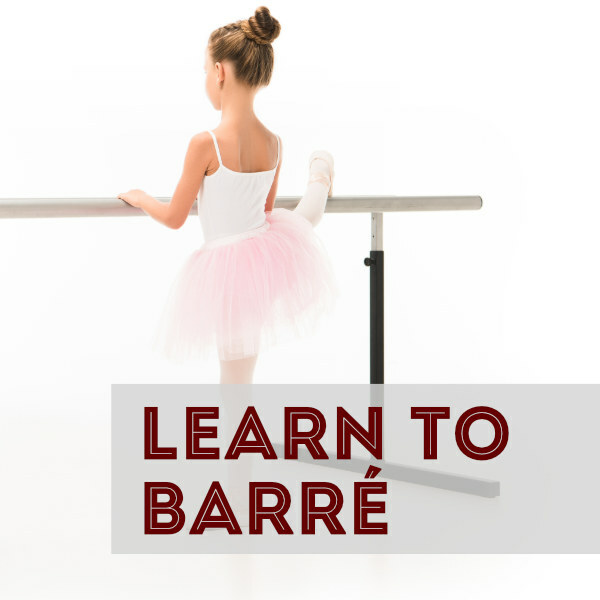 Discover how to Waltz, Tango, Foxtrot, Swing, Salsa, Barre and so much more. 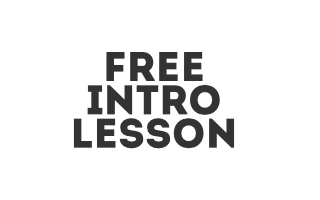 Contact owner Anastassia Abramenko today to book your first 30 minute lesson free. Improve your health and have with fun with dance fitness at our studio!